When the 1000 White Taras are named the tone of the planet will shift from one of fear to one of compassion, of love. It is something like the Durga myth. When the world was on the brink and the Gods threw their hands up in surrender and called on Durga to save this world, Durga came. She cut away greed and avarice and restored harmony. The Gods asked her to stay and be our goddess but she said , "No, that wasn't the deal I signed onto, but if you need me again you can call on me". And so we are. We are calling her to cut away avarice and we are calling on White Tara to remove the fear, thus allowing this to happen, through compassion... through love. 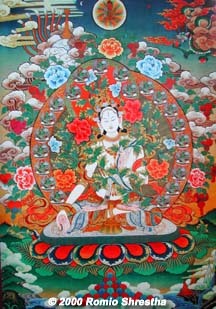 The myth of the White Tara began when she showed up as the tear of Avalokiteshvara, also known as Chenzering, who the Dali Lama is a reincarnation of. She appeared when Avalokiteshvara, the Buddha of all Buddhas, moved into a state of compassion... when his mind and his heart met in wisdom... and the suffering he saw because the the lack of this balance, made him cry. Then he could see Her... or it is said she appeared. For that is who she is, the compassion expressed in that tear. It could be said the tear cleared the eye to see her. She is the expression of compassion. It is time to let the waters flow... let our tears cleanse and nourish... let it dissove fear in all its manifestations especially hatred. Like the water thrown on the Wicked Witch of the west... melting, melting... let the fear melt as we see we are one with all.